THE BOARD OF the national maternity hospital at Holles Street has passed a motion to re-endorse the agreement it reached with St Vincent’s Healthcare Group (SVHG) last November. There has been growing controversy about the issue in recent days, with fears the Sisters of Charity, the principal shareholder in the SVHG, would influence the type of procedures carried out at the new hospital, which is set to be built on the same campus as St Vincent’s Hospital in Dublin 4. Can’t watch video? Click here. 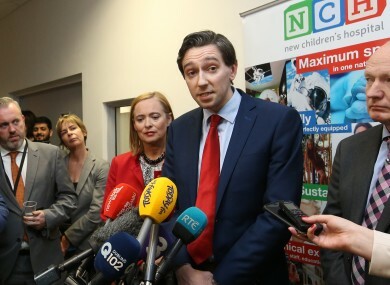 Earlier, Health Minister Simon Harris said the use of a compulsory purchase order (CPO) to buy the site at St Vincent’s Hospital “is not the ideal solution by any way, manner or means” to the controversy. The Wicklow TD said he did not want to say anything that would “further inflame the situation”, stating that he has called for a “period of calm” over the next month. The Sisters of Charity are to be given ownership of the hospital in return for providing the site. Labour TD Alan Kelly has suggested that a CPO could be used by the government to take control of the site. The idea was also raised by former master of the national maternity hospital (NMH) Dr Peter Boylan. We don’t need to be caught up in potential legal difficulties for a large number of years. We also have to remember the site is being donated free of charge. The issue was also discussed at today’s Cabinet meeting, where both Minister of State for Disabilities Finian McGrath and Children’s Minister Katherine Zappone said the hospital should be built on the St Vincent’s site. Harris said he informed his Cabinet colleagues today that he wishes to the use the “window of calm” to tease out the issues of concern. The issue of religious interferences is dealt with in black and white in the agreement … We have an agreement, that is the heads of an agreement, we need it in contractual and legal obligations, and I am asking for a month to tease through those issues. What I am very clear of is the law of the land will apply at the National Maternity Hospital. A government source said there should be “no ambiguity” that the hospital will be built on the St Vincent’s Hospital site. “It is absolutely going ahead,” they added. The Master of the National Maternity Hospital also defended the decision to relocate the new hospital on grounds owned by a religious order, saying that they will have complete control over medical procedures and governance. On Morning Ireland today, Dr Rhona Mahony said the hospital will be independent and retain their medical practices without religious interference. It’s the board’s duty to do their best for women and babies. We will not mention any religious, ethnic or other distinction [in hospital governance]. When asked about the clear dispute over governance, Mahony said they are the first of the colocations, but the integrity of their services and autonomy over them will be protected. “This is a separate company and it is very likely that in time that there will be a lease arrangement, [ownership over the building is] a technical issue over land. This hospital will be entirely independent – it’s black and white agreement. “The nuns do not want to run this hospital. It will be an independent hospital with an independent board. We will practice contraception, IVF, termination of pregnancy to save a woman’s life and in the future, we will expand services according to the law. Dr Peter Boylan, a former master of the maternity hospital, was asked to resign from Holles Street’s board at the weekend after he voiced his concerns about the colocation. This was decried as a silencing of opinion, but Mahony denies that was the reason, saying it was an issue of “corporate governance, not over opinion”. She said the vote to colocate with the Sisters of Charity was overwhelming: “25 voted in favour, one voted against and three abstentions”. There was no division in the National Maternity Hospital in relation to this move. Peter Boylan might have voted against if he disagreed. Factfind: Could compulsory purchase be used for the maternity hospital and what would it cost? Email “Holles Street board re-endorses deal to move maternity hospital ”. Feedback on “Holles Street board re-endorses deal to move maternity hospital ”.